At Tollwest, we believe Tollers should "have it all"....health, temperament, soundness, working ability and breed type. Any less, and you will never have the perfect dog. At Tollwest Kennels we've set very high goals for our breeding program. A lot of thought, careful planning, and intense research goes into each breeding here at Tollwest. It is our #1 goal to produce healthy, genetically & physically sound puppies while still preserving the breeds natural hunting abilities, instincts, trainability and temperament. We choose each pairing for a breeding only after hours of researching pedigrees to analyze the health, structure and temperament in the ancestors of the potential breeding partners. So whether your Toller is to be a hunting, show, obedience, agility or family dog, each litter is produced with the same goals in mind. I feel very strongly about having health clearances on all dogs used for breeding. We take great pride in producing high quality puppies. Our litters are whelped and raised as part of the family, and each puppy is given lots of individual care, love, and attention. Daily contact and stimulation is important to the neurological development of young puppies, therefore, each one is handled and socialized extensively. Shortly after birth, the puppies undergo Early Neurological Stimulation also known as the "Bio Sensor" or "Super Puppy" program, this is a form of very early socialization for the pups. The puppies are usually ready to go to their new homes at 8-10 weeks of age. Puppies are socialized with other dogs, cats and children, and are started on birds, basic retrieving, obedience, crate-training and housebreaking. We perform puppy aptitude testing on all our puppies, prior to placing them in their new homes. We also stress proper socialization and training at an early age! At Tollwest Kennels, we feed and recommend a raw food diet. All our puppies are weaned to a raw diet diet for optimum health, nutrition and development. We are also advocates of limited vaccine protocols. Please ask for more information. Toller pups will be ready to go early/mid Sept 2013. We are expecting versatile puppies that will be equally at home in the duck blind, in the show ring or hanging out at your feet after a hard day of hunting. We are currently taking deposits for pups, please see our website for more details! I adopted a Toller from Lisa almost 2 years ago. He was just over 2 at that point and deathly scared of a lot of people, mostly men. She was very thorough in making sure that he was going to a good home and was very selective. She did not allow immediate adoption which impressed me. I visited with both her and Jet 3 times before I took him home and bringing him home was definitely the best thing I've ever done. He's definitely a toller through and through. He lives for swimming and retrieving and is exceptionally smart. Lisa is awesome and is a wealth of information (I've never had a dog on a raw diet and she taught me so much that I've gotten most of my friends to start it with their dogs). I saw some of her others and they were all very well behaved and extremely good looking dogs. Jet is one of the best dogs I've ever had. He's extremely excitable and active but knows when it's time to stop and it really, really good at reading people. 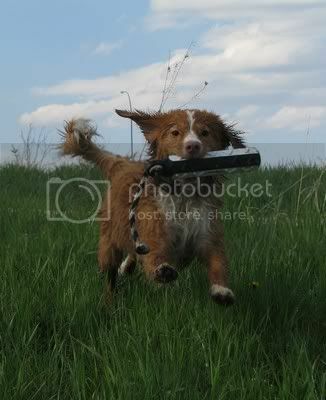 I would recommend not only a toller but any of Lisa's dogs as she definitely knows what she's doing. I have know about Tollwest for more than 8 years and they have some of the nicest Tollers around. I have been in contact with Lisa via email and find her to very knowledgeable and helpful. I have notcied that she is now the proud owner of Chesapeake Bay Retrievers. I, like her, have owned Chessie's for almost 15 years and I find them easily trained and can be very versatile. 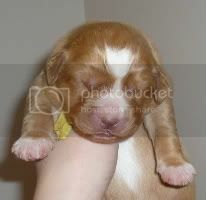 I would still love to own a Toller and hopefully in the near future that can happen. I would definately get one from Lisa. I co-own two dogs with Tollwest (Nessie and Avro) and could not be happier with them. Lisa has an amazing eye for dogs as well as an incredible passion to develop the breed not only in conformation, but personality and work ethic. My boy has finished his Canadian and American Championship as well we compete in agility, obedience and rally. My girl is still young, but we have great hopes for her! Lisa breeds dogs that can do it all! Bella, my almost two-year-old girl from Tollwest, is the smartest dog I've ever trained. She easily earned all her CKC rally obedience and CD titles by the age of 19 months and is well on her way to being ready for Open obedience. She's birdy, biddable, loves to swim, and is the light of my life. I have the most amazing toller you can imagine - his name is Leo and he is 17 months old. He is so laid back and yet when we take him outdoors he is very happy to run, prance and play with other dogs. He is quite submissive and would never hurt another dog or person. I have heard of the "toller cry" but have yet to hear him cry or for that matter even bark. Leo was very easy to train, in fact, he seems to be a natural. When Lisa takes him to shows, he naturally seems to know what to do. We couldn't be happier with our choice - hmmm... I think he chose us!! We would highly recommend a Toller from Tollwest Kennels - Lisa the breeder truly loves her dogs and always has their best interests at heart.